Suma, near Kobe.The former Saigoku Kaido Highway (旧西国街道, now National Route #2) and the Sanyo Railway Company’s (私設山陽鉄道) Hyogo-Himeji Line along the Suma Coast (須磨の海岸) nearby Kobe, Hyogo Prefecture. During the Edo Period (1603-1868), the Saigoku Kaido was the most important highway in Western Japan, connecting Toji in Kyoto with Shimonoseki in Yamaguchi Prefecture. This area, now Sumaura Park (須磨浦公園), saw a decisive battle between the Genji and Heike clans in 1184 (Genryaku 1, 元暦1). 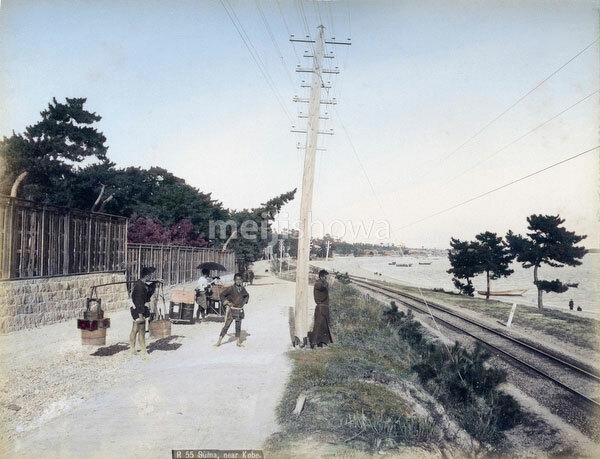 The railway line was opened in December 1888 (Meiji 21), so this image dates probably from the 1890s.